I have often wittered on about my dislike of social media. I have never said much about another bugbear of mine; cyber crime, I think it is called. You are probably thinking that I am referring to those criminals that hack into accounts and steal money from you. Yes, that certainly worries me, but that is not the crime I wish to (g)ramble on about today. The cyber crime that I am annoyed about is the sort of thing Norton or Amazon get away with. What the devil am I talking about, I hear you query. Have you ever bought something from Amazon and been offered speedy delivery if you sign up to a free trial of something called Prime? Yes? Did you fall for it? Of course, Amazon rely on you forgetting that you accepted the offer and also forgetting to cancel the deal before the free trial comes to an end. And when that happens? Voom! Your bank balance is suddenly a few quid less than you thought it should be. Do these companies refund the money when you realise your mistake? Of course not. Didn’t you read the terms of the agreement, they will ask. Does anyone read the terms of the agreement? I doubt it. Anyway, they will point you in the direction of sub-section 18, paragraph 4, clause b, item iii, where, if you had bothered to look, you would have noticed that you have signed up to accept whatever the product is for a full calendar year after taking advantage of the ‘free trial’. Ha! Free trial my old boots! There’s no such thing. Here is another example of cyber crime that occurs every year without fail. My house insurance is paid on an annual basis by direct debit. Okay so far. Say it cost £200 last year. [Okay. ‘It cost £200 last year.’ Now what? - Ed.] Ahem... When it was due for renewal, I received a letter which states simply that my house insurance is due for renewal and £300 will be taken from my account on such-and-such a date. That is it. No explanation for a 50% hike is given. Obviously, I phone them to query the new price. There is no apology about them trying to rob me. Instead, I am told that I could qualify for a ‘loyalty discount’ or a ‘no claims discount’. What they really mean is that their con has been spotted and they will put it right. But do they? They will do a quick ‘calculation’ and tell me that the new cost of my premium will be £220. I then accept the figure and thank them. It is only after putting the phone down and congratulating myself that I have saved myself 80 quid that I realise I have just volunteered to pay 10% more than I did last year. Doh! I believe that when they compose those letters to their customers, the insurance company people know that they can’t lose. The only way they might lose is if somebody just cancels their insurance with them. They know, though, that most people won’t do that. Can’t be bothered with all the hassle, see. However, the insurance company people are well aware that many people won’t even query the letter. They will just think that home insurance cover has gone up a bit and do nothing about it. Legalised crooks, that’s all they are. Billy Bodin's 29th-minute effort earned Bristol Rovers victory over Swindon Town in a low-key West Country derby in League One. The Addicks' were a man short from the 12th minute onwards following Lewis Page's red card. After Page was sent off for a professional foul on Josh Vela, Clough then made the punishment count double with a brilliant free-kick, his ninth goal of the season. But Robinson's side refused to lie down, equalising on 23 minutes when Jake Forster-Caskey's free-kick was turned in at the far post by defender Bauer. The Addicks then grabbed a shock lead in first-half stoppage time when Forster-Caskey led an impressive counter, feeding Byrne to slot the ball under the advancing Ben Alnwick. Charlie Wyke put Carlisle in front by scoring his 18th goal of the season, but John Akinde replied with a penalty for the Bees after the visitors had Simeon Akinola sent off. David Wheeler scored the only goal of the game as Exeter City extended their unbeaten run to 10 games with victory over fellow League Two play-off hopefuls Portsmouth. Doncaster were always going to be favourites and their captain James Coppinger was first to seriously threaten as he hit the outside of the post from 20 yards. Seven minutes later and the visitors did take the lead. A well-worked free-kick routine caught the home side napping as Conor Grant's cross was swept in by Mathieu ‘Long John’ Baudry. By the 35th minute it was 2-0, Matt Butcher at fault as he lost the ball to Coppinger who found John ‘Mary’ Marquis and the striker hit it low past Artur Krysiak. The second for Marquis was a superb individual effort on 80 minutes, as he broke from the halfway line and into the box before finding the bottom corner. Ho hum. Can The Grambler do any better this week? [Doubt it. - Ed.] Let’s see what he/she/it has randomly selected. Teaser time. Yay! Last week I asked you in which year the FA Cup was first won by a team that contained no players to have been capped at full international level. It was also the first time a team from outside the top division of English football won the cup. Well, the library book and Last of the Summer Wine should have helped you. Like those two, the year was 1973. The team? Sunderland. One for this week? Only four Scottish players have won Premier League winners medals. Three have won theirs with Manchester United. Who was the fourth and with which club did he achieve his medal? Fairly easy, do you think? And finally, Cyril? And finally Esther, I am indebted to a Mr N. Wisdom, one of our birthday celebrants, who helps to provide this week’s finishing clip. I told you he was a huge star in Albania. His films were the only ones by a western actor which Albanian dictator Enver Hoxha allowed to be shown. Comedian Tony Hawks came up with an idea that he could compose a number one hit record - his book One Hit Wonderland tells the tale - and with Tim Rice wrote this which they performed on Albanian television. Ladeez and gennulum here is Big in Albania performed by Norman Wisdom and the Pitkins. Would you like a wee factoid? Do you remember the Beeb Beeb Ceeb sitcom Some Mothers Do ’Ave ’Em starring Michael Crawford? Well, Michael wasn’t the first choice to play Frank Spencer. 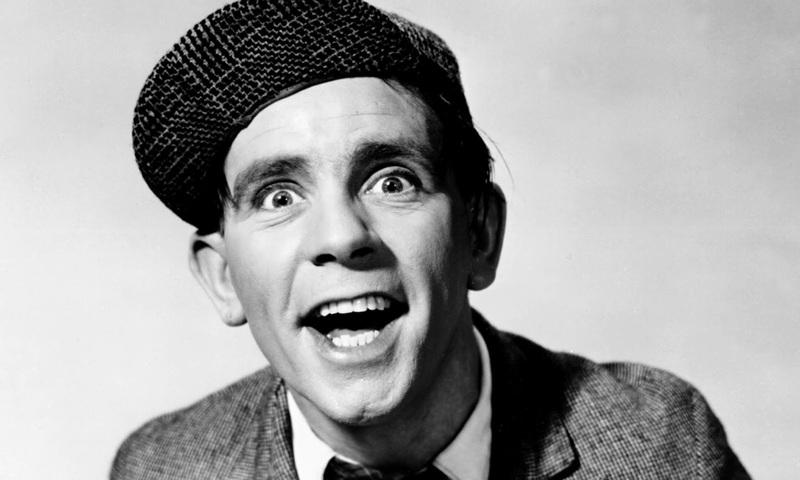 One actor considered for the part was your man Norman Wisdom. Jeez! Can you imagine that? I can only say, Norman’s loss was our gain.